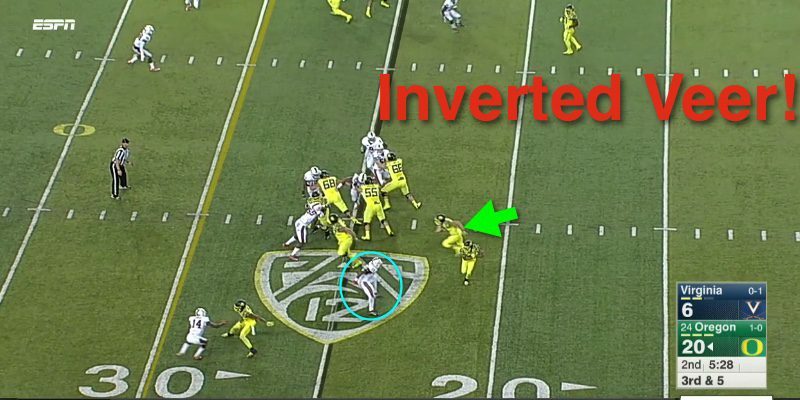 Oregon Stuns Opponents With New Inverted Veer Play! The Oregon offense under head coach Mark Helfrich continues to progress and add new components to keep its attack fresh. I was pretty surprised to see a new play that seemed to have elements of an Outside Zone Read combined with a Power Play, and the Grizzled Ol’ Coach identified it as the Inverted Veer play! It was made famous by Gus Malzahn of Auburn as Cam Newton was known to make a ton of yardage with it. 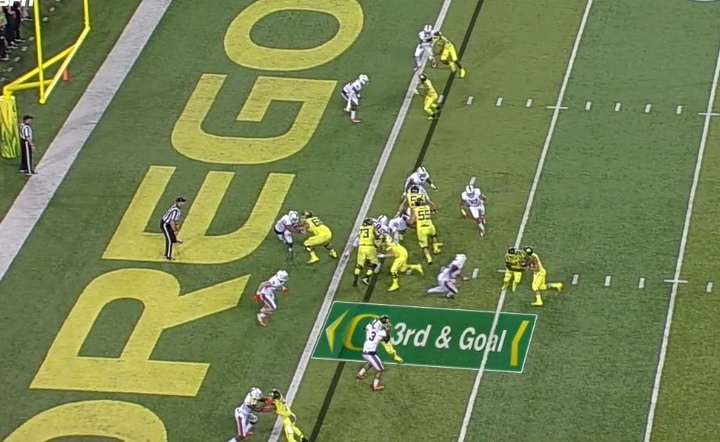 Two aspects that make it surprising Oregon would add this play to their repertoire is that the zone “read,” so to speak, is on the play side, or directly in front of the direction of the running play, while Oregon has always preferred to read on the back side of the play. The second surprise is one that retired coach Mike Morris noted: the intent of this play is to run between the tackles and requires a quarterback that is sturdy and can hold up to the pounding over a long season. Oregon has decided Dakota Prukop is up to the task, although the play was run only twice in the Virginia game in short yardage situations. The GOC suggested that this play “would be good for a strong, tall, powerful quarterback as a runner like Justin Herbert.” I invite Oregon fans to learn about this play and to watch for it as the season progresses. Hey, FishDuckers – if this is a glimpse of the future, let’s take a look! 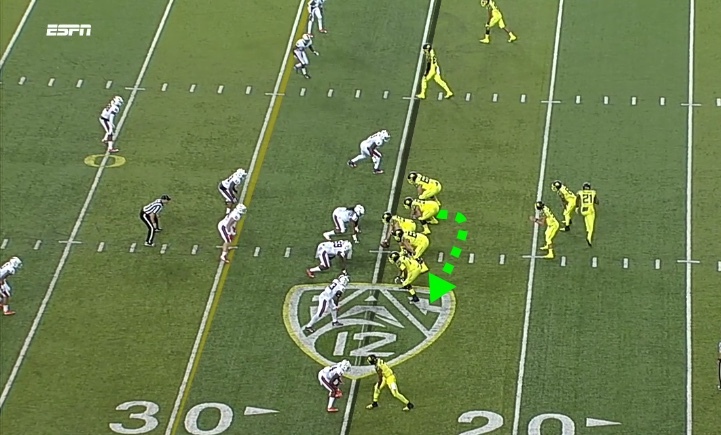 The Ducks (in yellow above) begin with a twin-back formation in the shotgun. 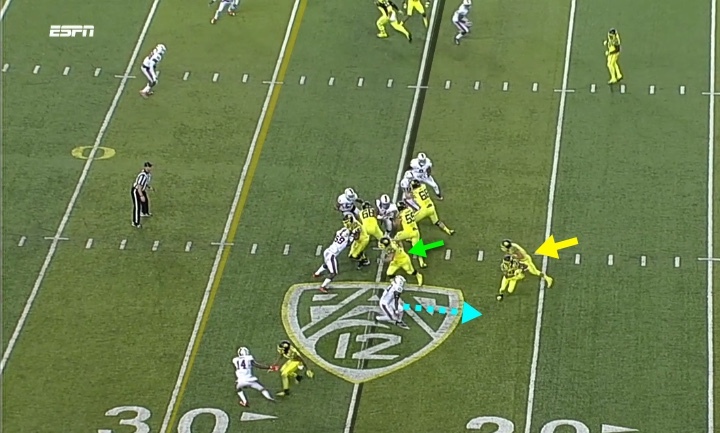 The running back lined up on the play side goes in motion for a bubble flare threat, which will draw defenders away from the play (especially when that player is Royce Freeman). The right guard is going to pull like a Power Play, but instead of running up the “B” gap, or between the guard and tackle on the left side, Doug Brenner is going to track outside the left tackle and head upfield. Above, you see Brenner begins to pull (green arrow), and you see the mesh with the Jet Back going from right-to-left (yellow arrow). The defender to “read” by Prukop is circled in light blue and is always the farthest line of scrimmage defender on the play side. The defender was concerned about the Jet Back. The defender being read (light blue dotted line) moved toward the Jet Back, which opened up a lane for Prukop to run (yellow arrow), and he follows the lead block of the pulling guard (green arrow) for a first down! 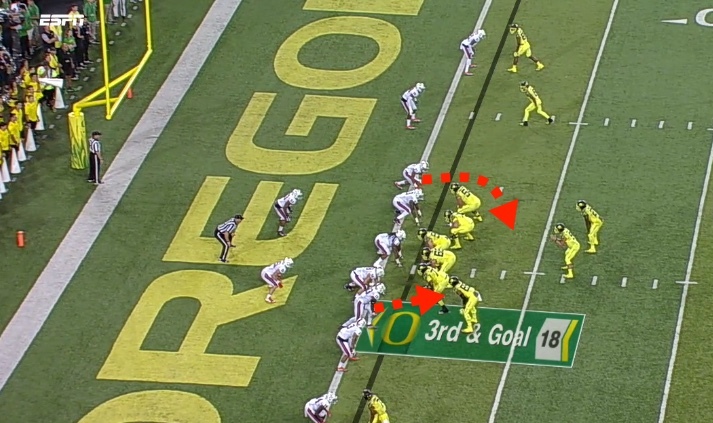 Oregon ran tons of Zone Read plays during the course of the game such as the Inside Zone Read, and Outside Zone Read – both relying on reading a defender ‘behind’ or on the back side of the play. 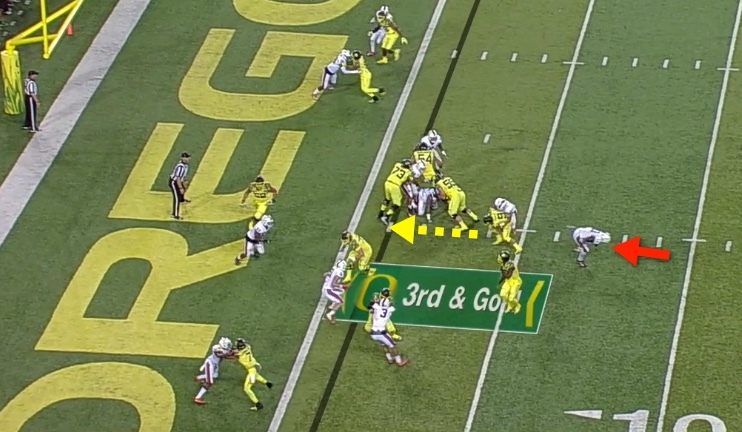 It was fascinating to see the Ducks’ Zone Read right where they wanted to run the ball and to use it for short yardage to surprise the defense. The Outside Pincer Blitz, an effective tactic to stop the Zone Read. 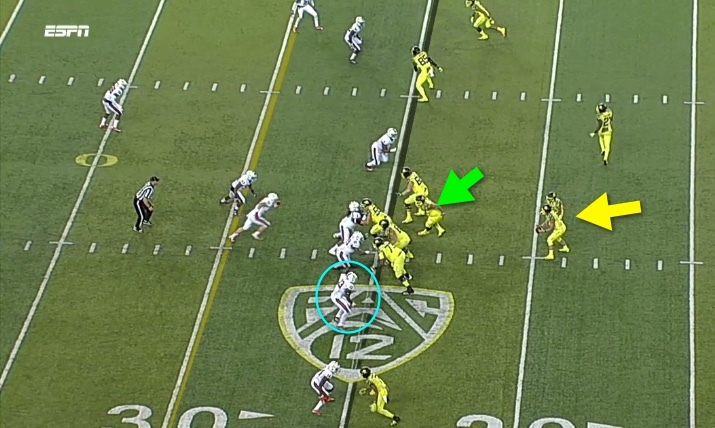 Oregon ran the play again just before halftime in another short-yardage situation. 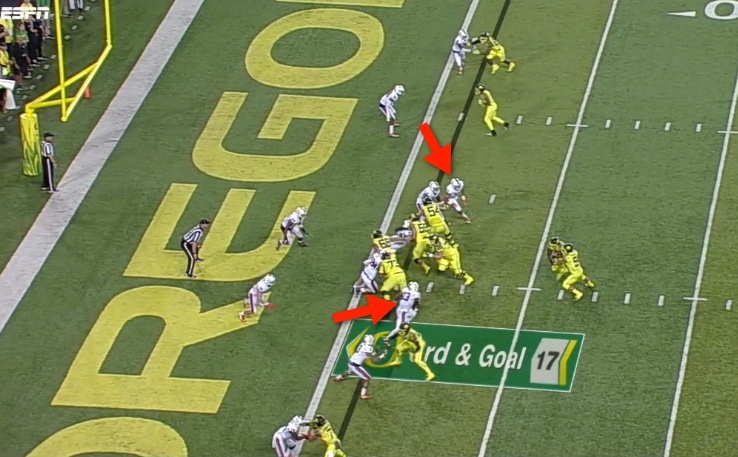 What messed things up was a tactic the Ducks have seen the last couple of years that I call the “Outside Pincer Blitz,” where defensive ends or blitzing linebackers on both sides of the LOS will blitz at the snap of the ball. The intent is to disrupt the reading process and get a tackle-for-loss (see dotted red arrows above). Just as the mesh has begun, we see the Pincer Blitz beginning at full speed (red arrows above). Prukop has a difficult split-second decision to make as to whether to hand off to the running back (Jet Back) or pull the ball and run with a blitzer attacking. The Duck quarterback is in a pickle, as the blitzer is bearing down upon both he and the Jet Back, as they are in the mesh (see above). Because the blitz was carried out immediately at the snap, the blitzer is able to cover both the quarterback and the Jet Back, which makes it hard to know who to give the football to! Prukop (above) decided to keep the ball and not risk attempting the hand-off, minimizing the chances of a fumble as the blitzer arrived. In these split seconds he was able to make the play side blitzer miss (red arrow above), but the back side blitzer foiled it all by tackling Dakota before the QB could get going. Too bad, as the running lane (dotted yellow line) is wide open in front of Prukop! In keeping with our new analysis philosophy at FishDuck.com, we show the negative (such as the above play) along with the positive, in order to learn from it and see what went wrong and how Oregon can execute the play correctly. Did Oregon do anything wrong? In the above example, I would argue “no” and instead, give credit to the Virginia defensive coordinator for being gutsy by calling a blitz in a big third-down scenario. Sometimes the defense does something exceptional to win the battle without the offense making a mistake.